– quote by Arturo O’Farrill. Like most, I really enjoy listening to all different types of music. From old school country, to jazz, to classic rock, blues, folk, some pop, classical, R & B, some rap, and even metal. My collection is from one side to the other, with a large variety in between. But, I have a long time relationship love with the guitar. Today I woke up, and started my morning with some classic “Heart”, with Ann and Nancy Wilson playing, and it’s just as good today as it was years ago, when the band first started. As the song, “Love Alive”, played, I got to thinking, who else, as far as guitar players, really get to me? In a good way, I mean. So, here’s a list of a few that came to mind today, but I’m sure that it would and should be a lot longer, but time didn’t allow me to get them all into this list, this time! So, for now, here’s my list of some of my favorite guitar players, in no particular order, and one of their songs that really shined for me. Nancy Wilson – Guitarist, singer, songwriter. Multi-talented artist. I love listening to her on “Love Alive”, as well as “Magic Man”. Outstanding! Emily Remler – Jazz guitarist that passed away way too soon. Listen to her playing “Snowfall”. It’s like so relaxing to me, I just love it. Jimmy Page – Oh, man. This man has taken me places that only a magic man can. I love Led Zeppelin. 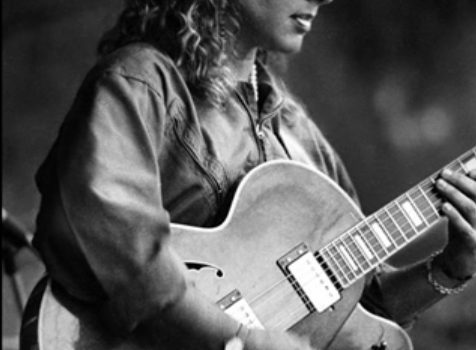 Robert Plant used to be my dream lover back in the day. But to hear Jimmy Page play guitar, classic. “Dazed and Confused”, also classic. Carlos Santana – On the song, “Maria, Maria”, his playing is so, so good! All of his collaborations with other artist blow me away. Deborah Coleman – “If you love me like you say”. Deborah recently passed away this year, sadly. She was a blues musician, and listening to her always puts a smile on my face. Chrissie Hynde – If you don’t know who Chrissie Hynde is, then you must be living under a rock. Fantastic artist and guitar player. “The Pretenders” were such an iconic rock group back in the day, and I still listen to them to this day. “Tattooed Love Boys”, “Lovers of Today”. Love. Love. Slash – So much to say about this guy, it’s just too much! From “Guns N Roses”, to “Velvet Revolver”, to his solo albums, Slash is electric in any band that he’s blessed with his playing. I think that the song, “Anastasia”, featuring singer Myles Kennedy, is fantastic. But in my eyes, Slash can do no wrong, as far as playing his guitar. Janet Robin – Local gal from Los Angeles, singer, songwriter, artist, Janet robin does it all and then some, but I love her guitar playing best. She rocks every tune, and she’s a solid performer. “Beautiful Freak”, “Flood”. Just a few of her songs to listen to, and her live shows are amazing to see. Poison Ivy – was the lead guitar player in the punk rock group, “The Cramps”. Their style was so unique, as one of the prime innovators of psychobilly music. Poison Ivy, (Kristy Wallace), always gave quite a show to the audience, and her guitar playing was memorizing. “Garbargeman”, “Bikini Girls with Machine Guns.” I must listen for anyone looking for awesome original punk sounds that are just plain fun to listen or dance to. Careful, The Cramps are additive. This is my short list for now. I left out some really good guitarist, Joe Perry, Steve Vai, Joe Satriani, to name a few. Hope you liked my list, and if there’s any that you haven’t heard of, then listen to them, google them. I like finding out about new artist, so if you have any suggestions, let me know!